From the German word for anticipation, this German stethoscope really lives up to its name. From the very first second you hold a vorfreude stethoscope in your hand, you can’t help but think “Why did I spend so much on that Littmann”? This stethoscope is a bit of a specialty as Vorfreude offers you a lifetime replacement guarantee. This basically renders your purchase risk-free. They state on their website that if you are not satisfied with your product, you can return it easily and effortlessly back to them. In return they will offer you a replacement for free, should you so wish. The vorfreude stethoscope has the same dimensions as a Littmann Master Cardiology, while being 5% lighter. This will prevent you getting strained necks from carrying your stethoscope around your neck. The diaphragm edges have a mirror finish to prevent corrosion and pitting. As it is manufactured and engineered in German you get to enjoy the famous German engineering quality when you buy this stethoscope. Its acoustics truly rival that of a Littmann, while costing only a fraction. 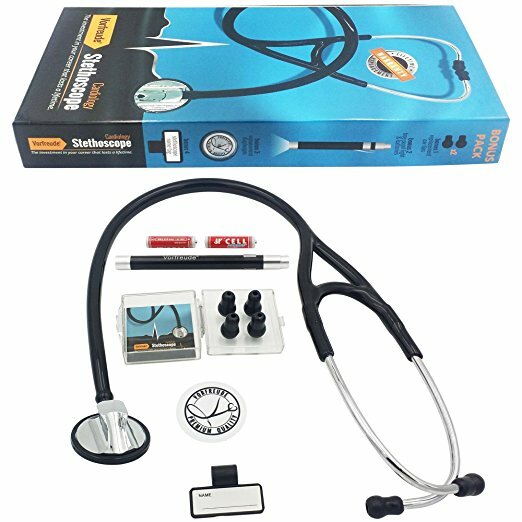 The complete Vorfreude stethoscope kit as described here not only features the stethoscope, it also has 4 replacement ear tips, a free Vorfreude pupil pen light and two AAA batteries. This makes it the perfect medical gift for you budding medical student or doctor-friend. Moreover this gift will last a lifetime thanks to Vorfreude’s lifetime replacement guarantee. The stethoscope’s patented BiChannel alignment allows you to flexibly adjust the headset and ear tips. This ensures a comfortable fit for a wide range of canal vector alignments. The dual lumen tube design and single head eliminates ambient noise interference. As a result this vorfreude stethoscope is perfect for EMT’s! The tunable diaphragm utilizes patented “PressFrequency”-technology that reminds strongly of the Littmann’s tunable diaphragm technology. Due to this fact this vorfreude stethoscope becomes a dream to handle for someone who is used to master a Littmann. “My best friends son is only in early high school but has already been accepted into an internship program at their local hospitals emergency room. He is an incredibly smart and talented kid who already knows that he wants to go into some form of medicine when he graduates. Because of this, I have been looking for anything that might help him in his future endeavors in the medical profession. In about 5% of cases it has been reported that the diaphragm which is attached to the Vorfreude stethoscope, tends to pop off. However thanks to the guarantee that Vorfreude provides you should be fine. The overall majority of people have reported no issues. Previous Article← Stethoscope For Sale – Get the best deals right here! And apparently acoustically it holds up pretty well. there just have been reports of the diaphragm tending to fall out in some cases!